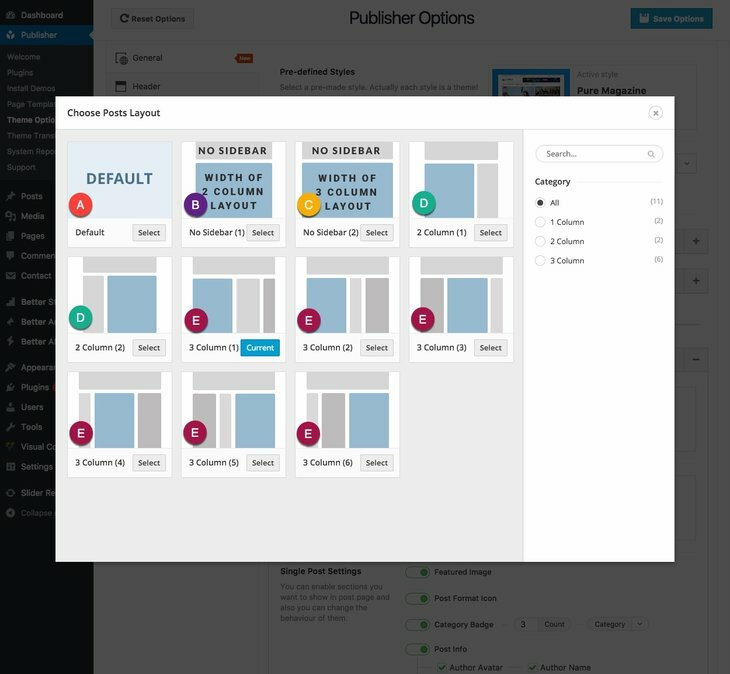 Publisher has 2 & 3 Columns layout which could be overridden in different pages (custom pages, posts, etc). That means for every page you can select a different page layout. When you choose two column layout, there is a main content column and a sidebar column. When you choose three column layout, there is a main content column and two sidebars. 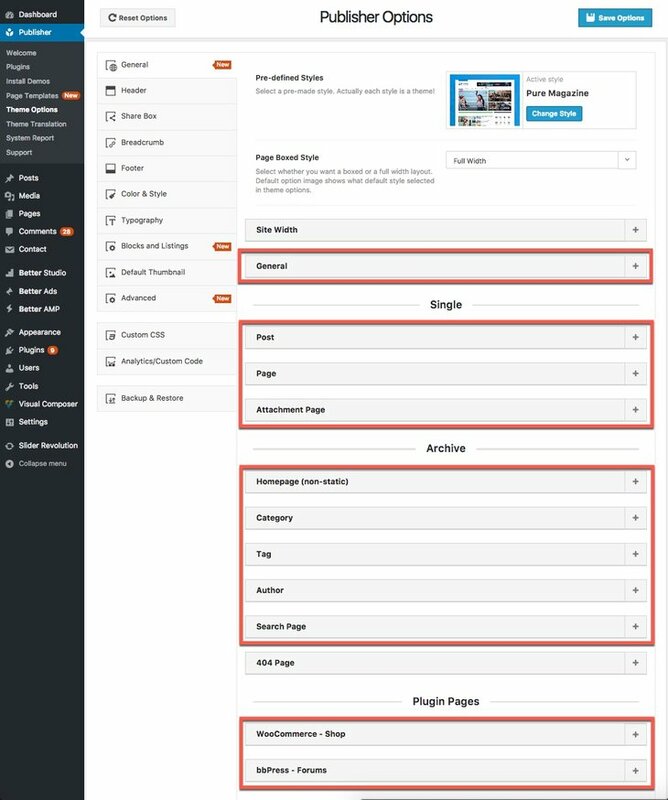 You can select a general layout for all pages of your website then override it for every individual pages. Let’s get started with changing layouts. We talked about option panel before and described some of its options (see option panel); Now we want to talk about selecting layouts for different pages. 1- Go to Publisher → Theme Options → General. Marked items (image below) have an option to select layout. General: This is default layout for all pages of website if other items are set to Default. Post: Default layout for posts page. Page: Default layout for pages (page post type; read more about post-types). Attachment Page: Default layout for attachment pages. Homepage (non-static): Default layout for non-static Homepage. Category: Default layout for category archive pages. Tag: Default layout for tag archive pages. Author: Default layout for author archive pages. Search Page: Default layout for search results page. WooCommerce – Shop: Default layout for WooCommerce pages. bbPress – Forums: Default layout for bbPress forum pages. As an example, we select one of them and change its layout. Rest of them have the same procedure. 2- Click on + in front of Posts to open the accordion. You see Posts Page Layout, click on Change layout. 3- There is modal opened and you see the list of all available layouts. In below image similar layouts are marked by the same color. 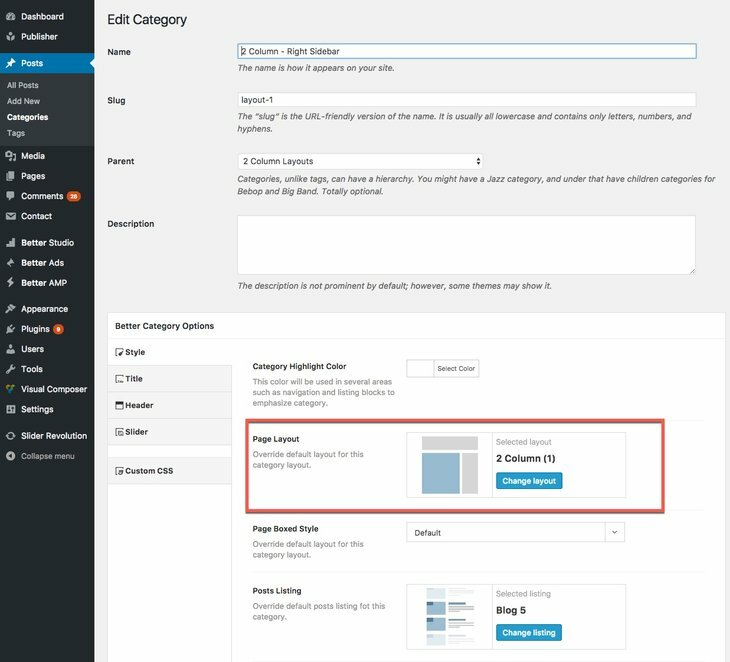 A: Use the layout you have selected in Publisher → Theme Options → General → General. B: No sidebar but it uses the width of two column layout (read Change Site Size). C: No sidebar but it uses the width of three column layout (read Change Site Size). How to Change Columns Width? Read Change Site Size + Columns Gap for complete information about resizing website and columns width. Can I Have Different Sidebar Layouts for Different Pages/Posts? Yes, we went through details of selecting layouts in this section. You can override layout of all categories, posts, etc, or override it for every single of them. For example if we want to change layout of one category (not all categories). 1- Go to Posts → Categories, edit the category you want to change. 2- Here you can see Page Layout, click on Change layout and change the layout as described in How to Change Layouts? Now layout of just this category is changed. You can do the same for single posts and pages, including bbPress & WooCommerce pages. 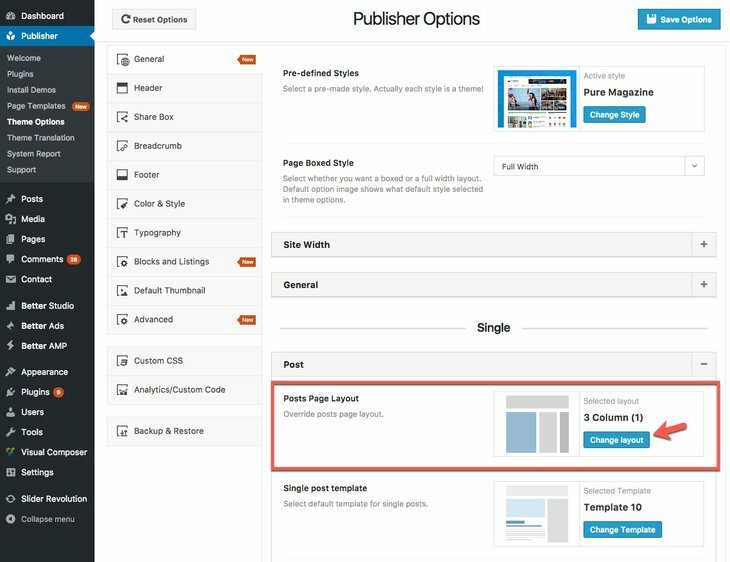 You can use different layouts for different pages in Publisher. For every layout its own sizing will be accounted. For example your homepage is three column layout with total width of 1300px, and posts use two column layout with total width 0f 1200px. Now your website homepage looks different from posts page.